Excessive facial and body hair (hirsutism) is one of the more distressing and visible symptoms of polycystic ovary syndrome (PCOS). This abnormal condition is triggered by the overproduction of androgens, a class of hormones responsible for male characteristics. Women with hirsutism will often experience the excess growth of hair on the face, neck, chest, back, and toes. To add insult to injury, the excessive androgen levels can have the opposite effect on the scalp, leading to female pattern hair loss (androgenic alopecia). Shaving is the most obvious choice to remove hair, especially of the face. It cuts the hair right at the skin's surface, leaving a blunt edge. And, despite what some people may tell you, it doesn't actually cause the hair to darken or thicken. However, the blunt edges can sometimes be noticeable if the shaft it especially dark or thick. Moreover, shaving usually needs to be done on a daily basis to maintain a hair-free appearance. The problem with daily shaving is that it can lead to the development of ingrown facial hairs and razor bumps (pseudofolliculitis barbae), particularly with African American or acne-prone skin. A dull blade can further contribute to this problem. To minimize skin irritation, always use a sharp blade and moisturizing cream. Waxing involves the application of a thin layer of heated wax to the surface of hairy skin. A cloth is then applied to the wax and held in place until the wax is hardened. The cloth is then yanked off with a tug, pulling the hair entirely out of the shaft. This can be done using a home waxing kit purchased at the drugstore. Unlike shaving, waxing only needs to be done every three weeks or so. While effective, waxing can cause short-term redness and swelling. Depending on the amount of hair that needs to be removed, it can also be quite painful. Ingrown hairs can also occur. Depilatory creams are able to dissolve hair using chemicals like calcium thioglycolate or potassium thioglycolate, while bleaching creams are able to remove pigment from the hair, making it less visible. Both are relatively easy to use, requiring nothing more than a thin application, a short waiting period, and a simple washing off. The main drawback of these products is the harshness of chemicals, especially if used on the face. To avoid this, test the cream on a small patch of skin and wait for at least an hour to see if there is any reaction. During electrolysis, a small needle is inserted into a follicle to deliver an electrical charge, killing the hair down to its root. While the procedure is considered a safe and effective form of permanent hair removal, any hair that is darker or thicker may require several treatments. The procedure itself can be a little painful for some, although most describe it as a mild stinging sensation. Short-term redness and tenderness are also common. The only other real impediment is cost. If you decide to pursue electrolysis, seek the services of a certified electrologist who has completed national testing. You can confirm the certification status through the American Electrology Association. During laser hair removal, a trained dermatologist will apply an intense beam of laser light to an area of hairy skin. While the procedure is not permanent, it can remove hair safely and for longer periods of time than waxing or depilatories. Laser hair removal is costly and may not be as successful in people with darker skin or lighter hair. If you do decide to pursue it, always find a dermatologist highly experienced in the technology. 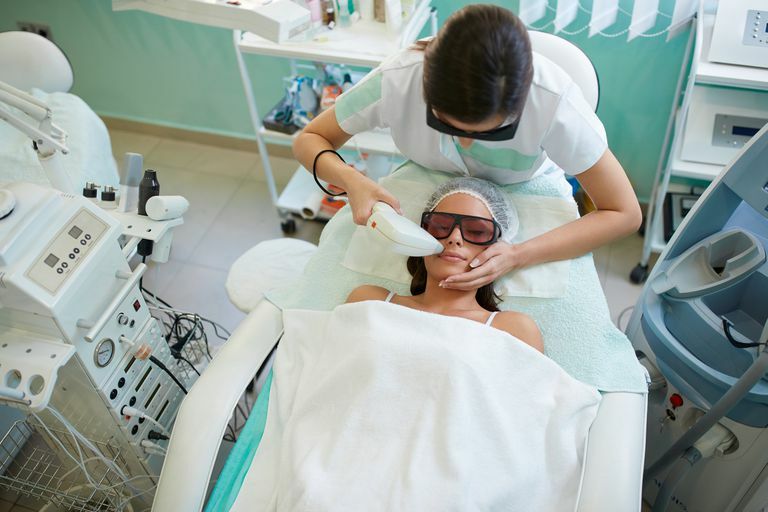 You can expect a slight stinging sensation during the procedure, and there may be some short-term redness and swelling. Other side effects, while uncommon, include blistering, crusting, and changes in skin pigmentation, most of which occur as a result of untrained or unqualified providers. Instead of treating the symptom of hirsutism, there are medications that can help correct the hormonal imbalance and reduce the number of circulating androgens in the bloodstream. Oral contraceptives can help by raising the level of female hormones while dampening the production and effects of the circulating androgens. The anti-androgen medication Aldactone (spironolactone) inhibits the production of testosterone while blocking the androgenic hormone receptors on hair follicles. Flutamide is a drug that suppresses androgen production without increasing female hormone levels. Due to the risk of liver toxicity, it should only be used under the close supervision of a doctor. As with all drugs, there is a potential for side effects. Speak with your doctor to fully understand the potential benefits and consequences of use. Many of these drugs may be covered by insurance, but double check with your provider just in case. Liu, K.; Motan, T.; and Claman, P. "No. 350-Hirsutism: Evaluation and Treatment." J Obstet Gynecol Can. 2017; 39(11):1054-69. DOI: 10.1016/j.jogc.2017.05.022.